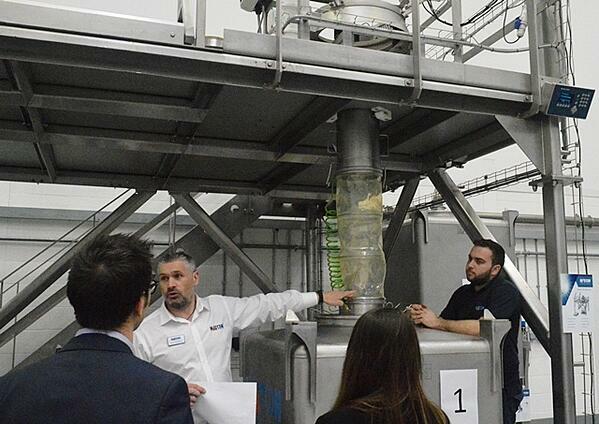 On Wednesday 28th February, we were pleased to welcome food manufacturing professionals from across the UK to our Head Office in Evesham for a day of expert presentations on allergen handling, including a working tour of the Matcon Test Plant Facility. Despite the snow and cold weather, we were delighted to have so many visiting Matcon HQ as MD Stephen Ball welcomed everyone and commenced the morning of presentations. Our first presenter of the day was Pauline Titchener from Neogen. Pauline delivered an in depth presentation on ‘An introduction to Allergens’ that highlighted current hot topics, the importance of clear labelling, potential new allergens that could now be included on the EU list and the change in allergen thresholds that manufacturers will need to adhere to in the future. Pauline also explained the recent changes to legislation and demonstrated how poorly managed production lines and suppliers lead to increased risks. 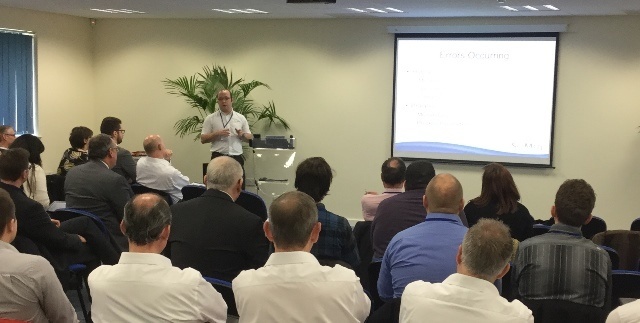 Her presentation was followed by Matcon’s Richard Meheran who demonstrated how using IBCs enables manufacturers to contain powders and reduce the risk of contamination between manufacturing steps, whilst keeping all equipment active. The next presenter of the day was Adele Adams (Adele Adams Associates), who discussed with delegates the importance of integrity and the new challenges and threats to the supply chain. The key topics raised by Adele included, the management of raw materials, reviewing the supply chain and the common errors being made that can lead to contamination risks. Delegates were given an overview of how using MicroNIR Near Infrared Spectrometer (NIR) can improve production line quality by identifying contaminants. Darren Machen (SciMed) demonstrated how NIR can provide accurate physical and chemical information, helping to identify raw materials along the production line. Darren provided examples of how this could benefit manufacturers with real-time feedback, enabling them to pinpoint issues quickly and efficiently take action. Before lunch Pauline Titchener from Neogen talked further about onsite testing, how to perform adequate testing and the current options for allergen analysis. 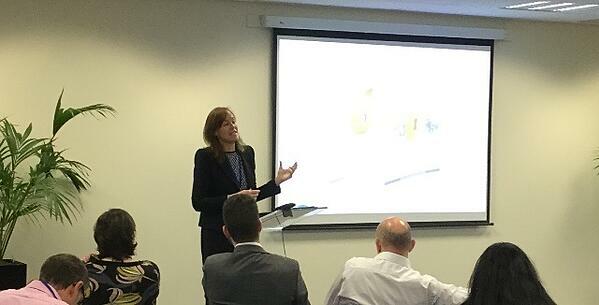 Pauline provided some case studies and explained how manufacturers can identify commodity co-mingling and the common issues that can occur if contractors are not fully aware of their production line requirements. One of the highlights was a tour of the Matcon test facility. 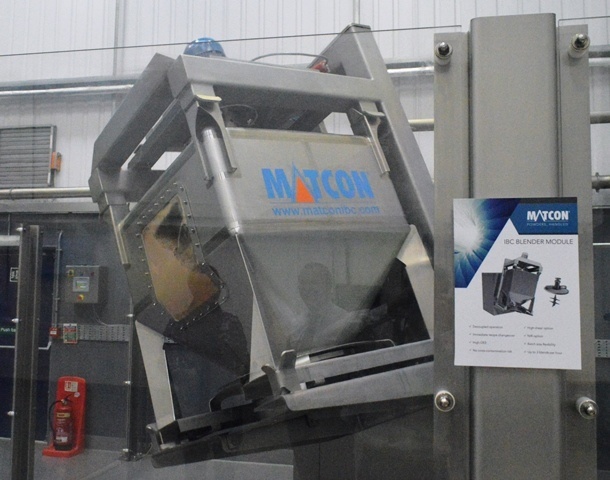 Delegates were shown how using IBCs can reduce the risk of contamination at each stage of the manufacturing process, with working equipment demonstrations provided by the Matcon team. These demonstrations included the range of filling, blending and packing equipment available, as well as wet and air cleaning modules that can be used to eliminate the risk of contamination. The team also explained and demonstrated how many of the parts on each module can be removed by hand, quickly and either cleaned offline or immediately replaced to provide a clean production line to stop any contamination from occurring inbetween batches, whilst maintaining a high OEE. Using the filling module (pictured below) the IBCs can be filled with powder in a contained manner: once completed the module can be cleaned down easily and quickly, reducing downtime. The IBC blender (shown below) demonstrated how powders can be mixed in a sealed container and unloaded easily without the need for cleaning down time, removing the time wasted by traditional fixed mixers. 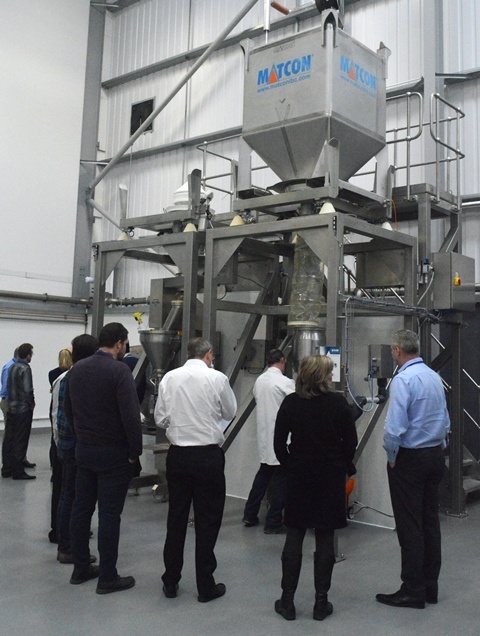 Delegates were also shown the packing line refill and sack filling system that delivers automated and controlled flow, ensuring a complete discharge from a Matcon Cone Valve IBC. There was a demonstration of the quick strip down and assembly time taken to immediately change over recipes during production. As cleaning away potential contaminates was a key topic for the day, delegates were shown how the Matcon IBC could be efficiently cleaned to significantly reduce downtime in a safe, repeatable wash sequence using both an air-wash and wet-wash.
After the tour and lunch break, it was back to the expert presentations, beginning with John Etherington (Etherington Technical Consultancy). 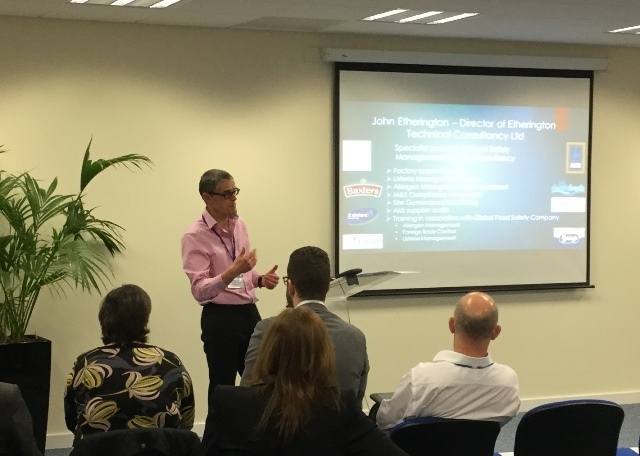 John provided delegates with an overview of the allergen risk assessment process with a suggested format of a risk assessment and cross contamination, covering the specific requirements that should be considered. John also explained how this could be implemented in a factory, especially when creating new product lines. The advice on segregation and allergen handling was well received with clear case studies highlighting where previous manufacturers have made mistakes. Matcon Sales Manager Steve Hewitt, then discussed the importance of automation in reducing risk. 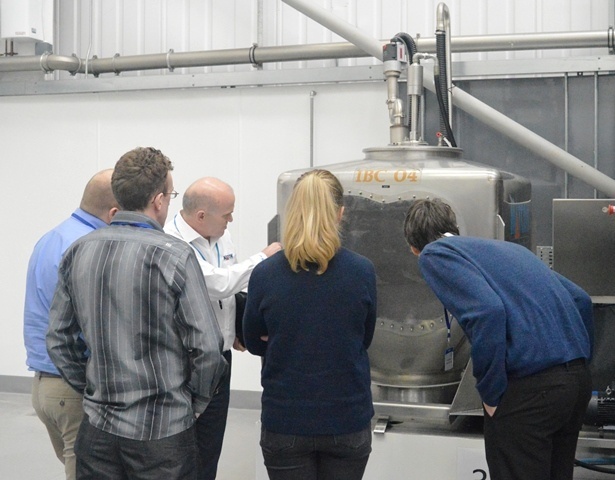 Steve used examples that had been illustrated in the test facility tour to explain how automated formulation, blending and packing can assist with throughput whilst reducing risk of contamination of allergens through human error. Our final speaker for the day was Steve Matthews, Matcon’s Systems Support Engineer. Steve advised about the importance of finding the right factory design and layout to ensure that the space available is efficiently used. He raised the importance of clear planning when designing a factory which included identifying the main loading routes and utilising ‘free’ space, rather than building a larger factory. The day ended with a tour of Matcon's assembly facility, giving delegates the chance to see how Matcon develops and builds equipment before it is shipped worldwide. Following the Open Day the feedback has been extremely positive and we are looking forward to organising another event very soon. If you would be interested in hearing more about our open days or related events then please contact us. Are you complying with FSMA regulations?